Your little angel has finally graduated from “baby” to “toddler” and is heading for “pre-schooler” like an interplanetary rocket. 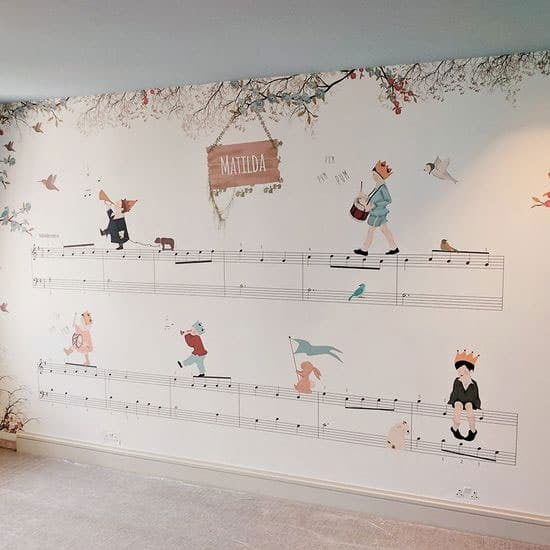 It’s time to hand down those pictures of cute smiley face clouds and sunbeams and replace them with pirates, princesses, trucks and trains… This is also an essential time to make sure your child has a strong connection with their bedroom. It shouldn’t be a place they associate with being forced to go to sleep. They should want to go there because, in their opinion, it’s the coolest room in the entire house! Your 3 year old will be the first to let you know what they love. 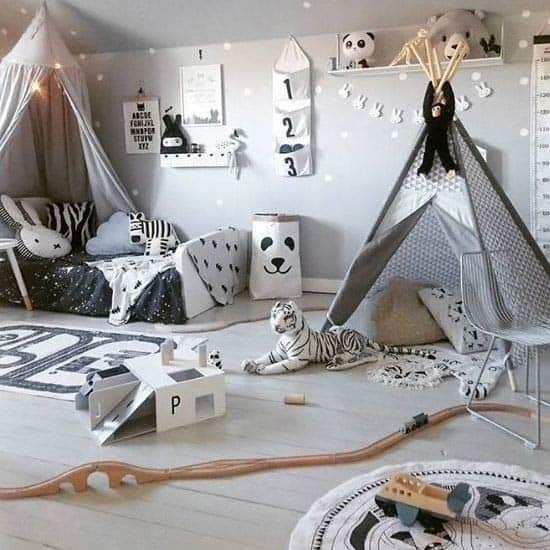 From simple decorations to elaborate, over-the-top, redesigns, you can have as much fun as your pre-schooler turning their bedroom into a transcendent world beyond their imagination. 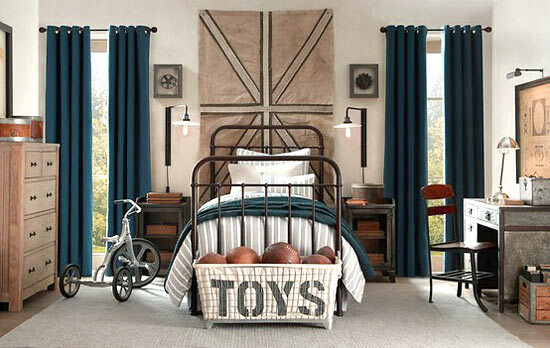 All you need to do is find a way to translate their passions into a practical and affordable bedroom revamp. 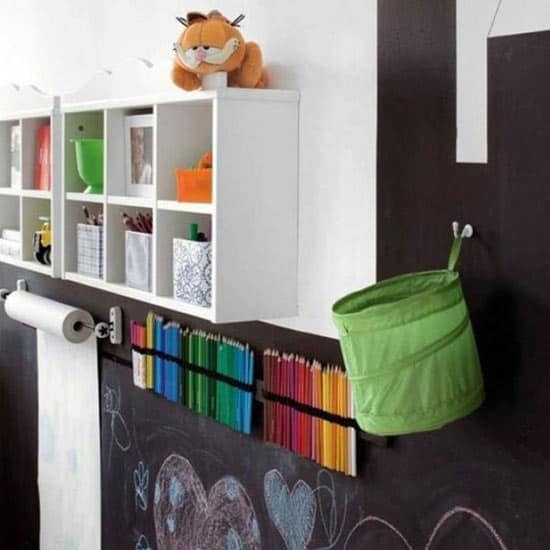 From here you can incorporate some of the smart, space saving storage ideas as well as some other clever solutions. 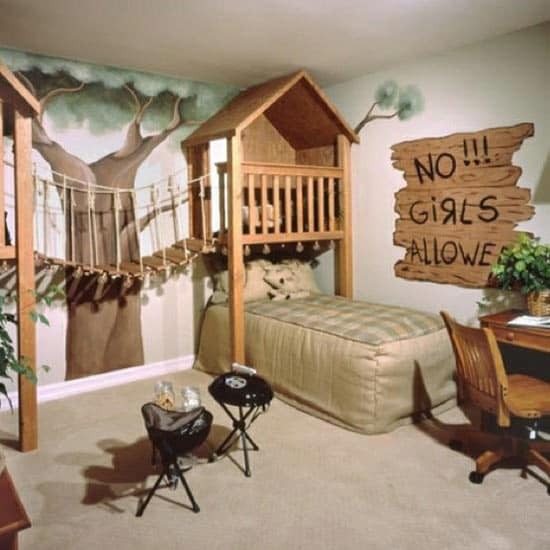 Here are some great kiddies bedroom ideas to get you started. It’s about time to start thinking about upgrading to a twin mattress for your toddler/ preschooler. 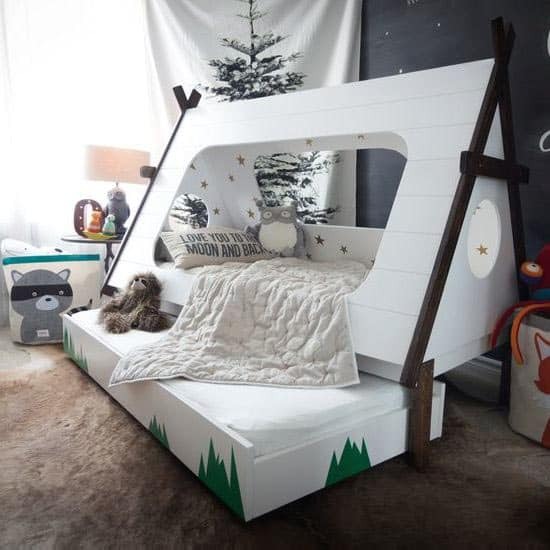 Their little growing bodies will begin to outgrow their toddler bed and needs the space of a twin mattress to be able to flourish unencumbered. A twin bed also allows for a major storage upgrade as the space below the bed can be used for a whole host of packing options. 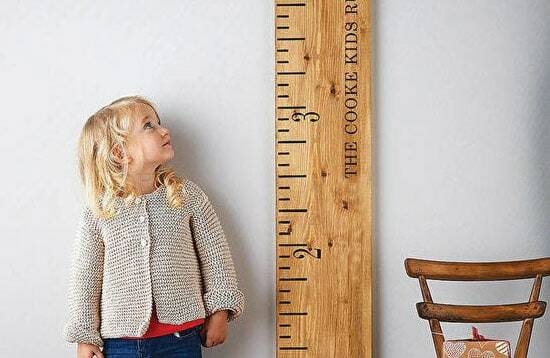 Speaking of growing, why not install a DIY growth chart where your toddler can measure their height. It will give them a sense of accomplishment knowing that they are growing their little bodies taller and taller. It also helps to make eating healthy make more sense visually. 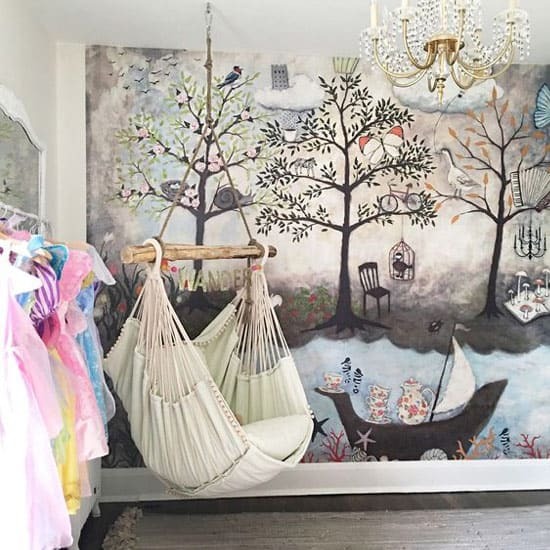 Whether it’s for bedtime stories or fun playtime, a hanging chair adds a charming element to any child’s room. Plush pillows make it all the more comfortable for kids and adults alike. 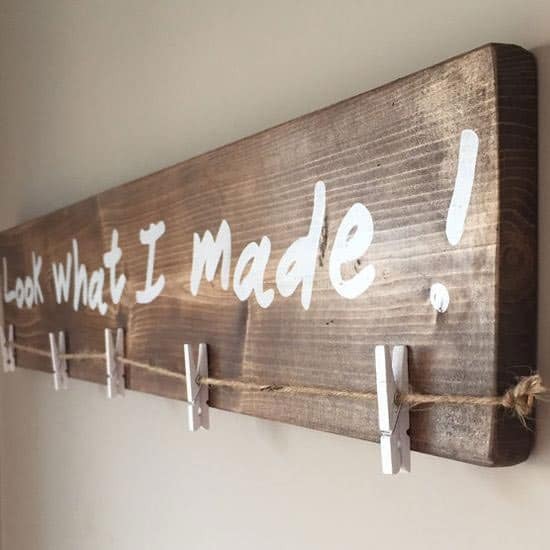 Make sure to secure it really well… toddlers might just want to swing it right off the hinges! You can get as complex as you need, even including things like locks and keys, or complex puzzles. You don’t even need a backboard if you attach the various gizmos and gadgets directly to the wall. 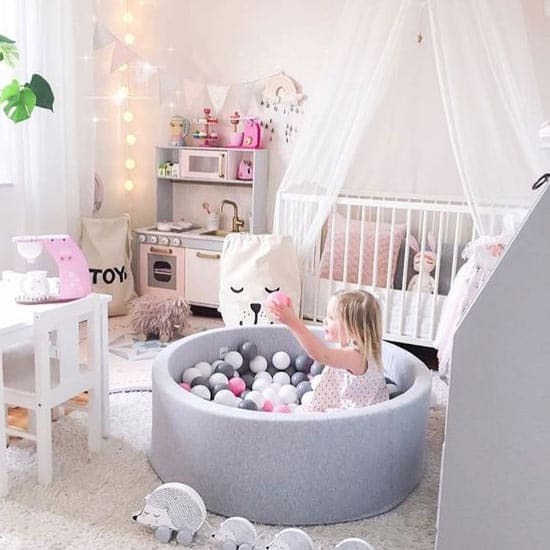 I don’t know a boy or girl who doesn’t love swimming in their very own ball pit, right in their bedroom! Depending on the color scheme of the room, you can buy matching balls to compliment the decor. A soft foam wall can easily be attached to a circular foam base and upholstered in the same tones. 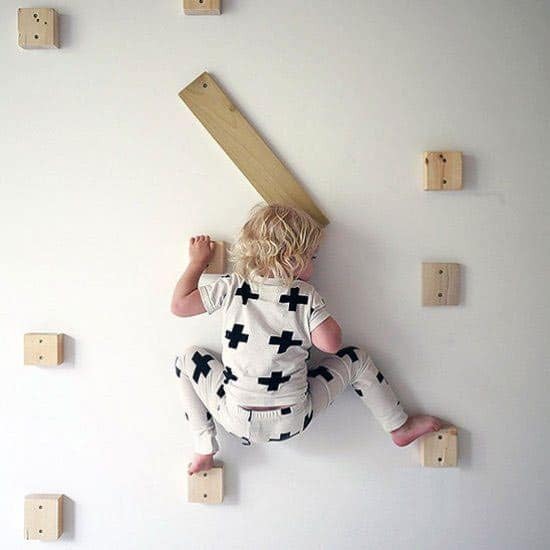 By know, your child is learning the important dextrous skill of climbing on things. This promotes muscle development as well as hand-eye coordination. You can make the climbing wall as simple or as fancy as you wish. Building it over a solid bed frame will eliminate the need for a separate climbing mat. 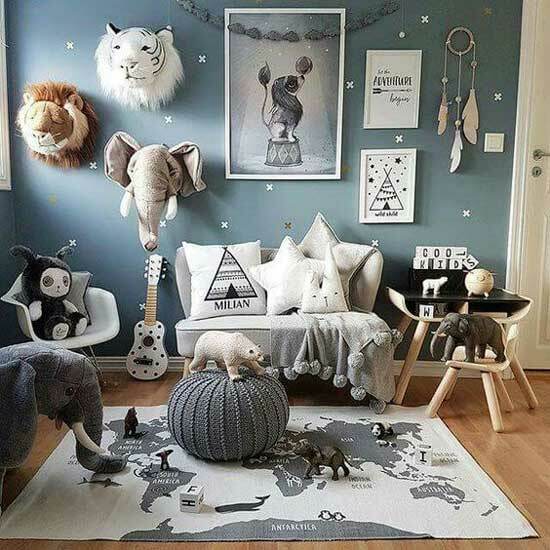 Teach your child about the different animals from around the globe by gathering unique plush animals found only in certain parts of the world. This teaches geography and fauna at the same time. There are several children’s books with supporting stories about weird and wonderful animals. Create a simple Teepee tent with some basic bamboo joined at the top and covered with material. Adding rugs, blankets and pillows make it all the more inviting. Little ones will love to crawl inside and close up the tent door while they play hide-and-seek or peek-a-boo. Keeping with the general tone of the room, you can do a lot to emphasize the color scheme with the dramatic visual impact a teepee makes. Who doesn’t love camping at 3 years old? With a bit of ingenuity, you can construct a simple “tent” over your 3 year old’s twin size bed and they’ll feel like they’re spending the night under the stars. Adding tree prints gives the whole room that “forest” feel. It’s a winner for kids who love being outside in nature. 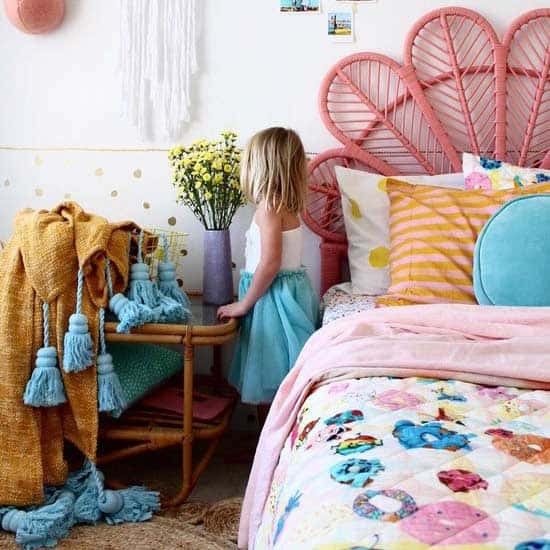 The colorful bursts of the bohemian style bedroom will leave your little angel loving the warm inviting tones of her special haven. The great thing about this style is, with all this color, you can’t really go wrong. Almost anything goes… colors, patterns, shapes and textures collide in a spectacular explosion of fun. Let your child’s creativity explode onto a full blackboard wall with colorful chalks close at hand. From experience, I know that this can cause a pretty big mess on the carpets so you may want to minimize it to where the floors are tiled or keep the area a little smaller. 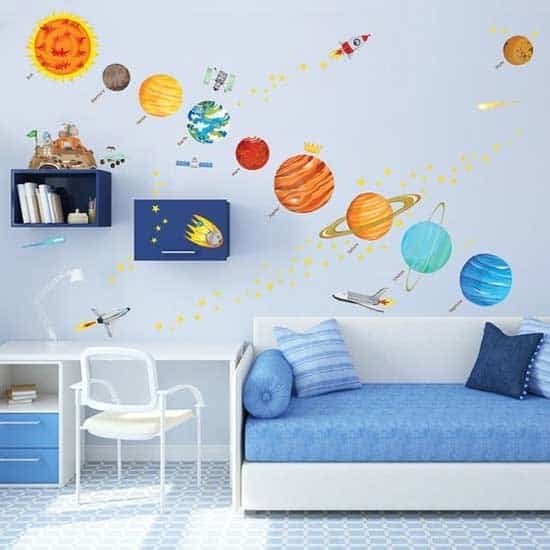 Teach your child the names of the planets as they lay under the space themed ceilings and walls. Rocket ships and the occasional hidden alien will inspire supersonic flight across the galaxy. The added benefit is that, since stars are visible at night, it supports the idea that night time and bedtime is just around the corner. 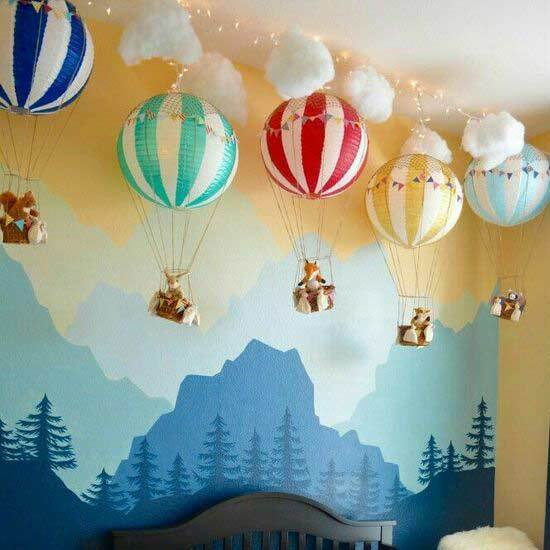 Let your 3 year old’s imagination drift away on colorful hot air balloons as they float across the sky. Simple Chinese lanterns can be painted and decorated to look like balloons and with a little string and some tiny baskets, you can even add fluffy little stuffed animals for a real authentic look. Bring in a touch of the vintage style be eliminating plastic and battery operated toys. In fact, eliminate technology all together as you create a simpler traditional look with wood and metal contrasts. Leather and other natural materials add the final touch. A real down to earth bedroom with a wholesome, classic feel. There’s absolutely nothing stopping you from bringing musical instruments into the bedroom. Sure there’ll be some noise, but the development of an understanding of music and sound at such a young age is priceless. A keyboard can be switched on and off if you think that noise might be an issue. And, of course, drums are another great option if noisy children do nothing but bring music to your ears. Sticking with the music theme, why not grab a ruler and create some beautiful staves for a truly melodic theme. 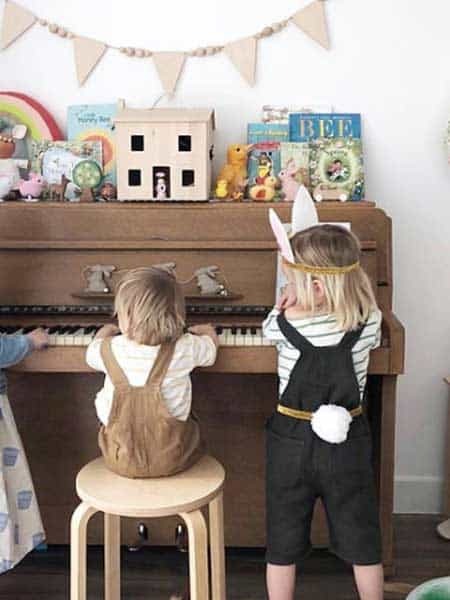 You can recreate your 3 year old’s favorite song and point at the notes as the song progresses. This will not only teach them about where notes lie on the staves but also how rhythm works including rests and pauses. This can apply to any form of air transport. 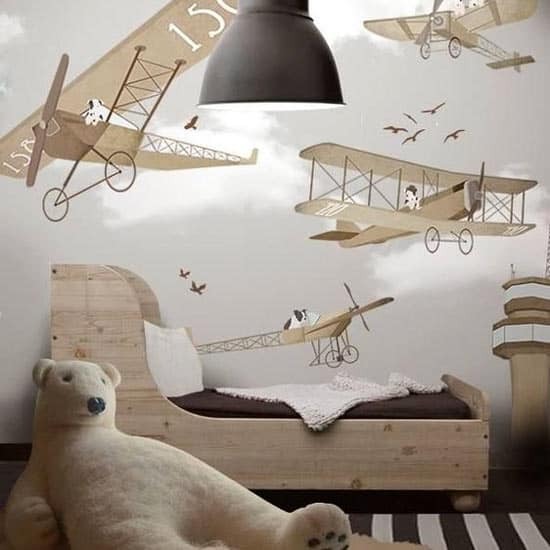 Use muted colors and stylized images to create a cornucopia of planes, airships, helicopters or microlights buzzing through the sky in all different directions. This will test your artistic prowess to the max as the various angles might prove tricky. You could always trace pics from the internet to make it a million times easier. 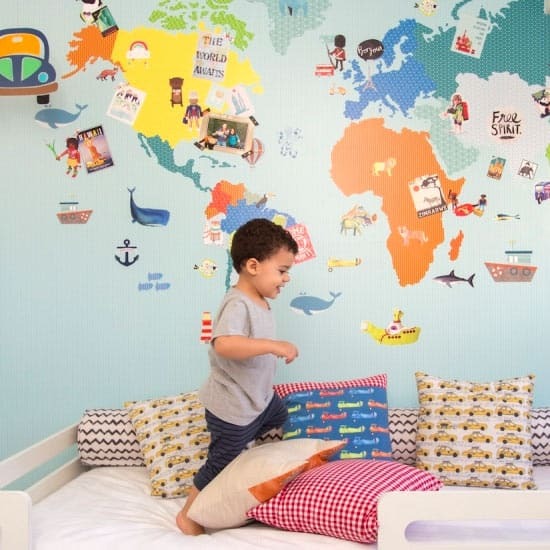 Here’s a cool way you can start teaching your toddler about the world. A large world map with different landmarks and animals along with the names of the continents! You can create in any color you want, to keep with the theme of the bedroom. 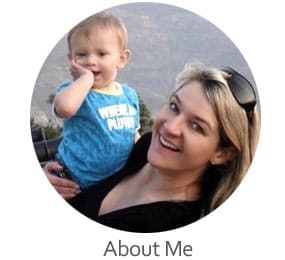 You could even add pictures of your very own travels. Your 3 year old will be bursting with creativity. Make sure they get the opportunity to live out their creativity by giving them a dedicated art corner with pencils, crayons, clay, pastels, and paints. Since it’s a safe, dedicated art space, they’ll know to keep the messy stuff inside the perimeter and they won’t be afraid to really let the creativity run wild. Since they’ll be creating priceless masterpieces, why not give them a dedicated place where their cherished art can be displayed for everyone to see. As they see the look on your face, it will inevitably inspire even more creativity. It’s a truly invaluable boost to their creative development at such a significant age. Every child has a favorite character, whether from a children’s book or an animated movie. 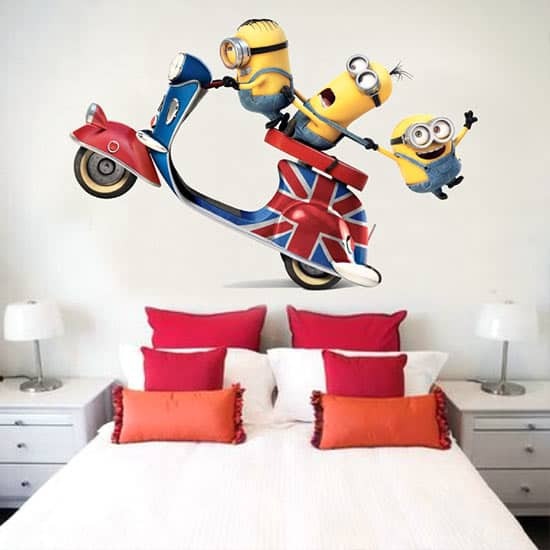 They will be over the moon when you stick up some oversized wall stickers that add some spectacular imagery to the room. These can be picked up from Amazon, or even custom printed at your local print store. Some little ones just want to sail away and conquer undiscovered lands. A wooden maritime feel with furniture straight out of Davey Jone’s locker will leave them feeling like they are the captain of their very own pirate ship. 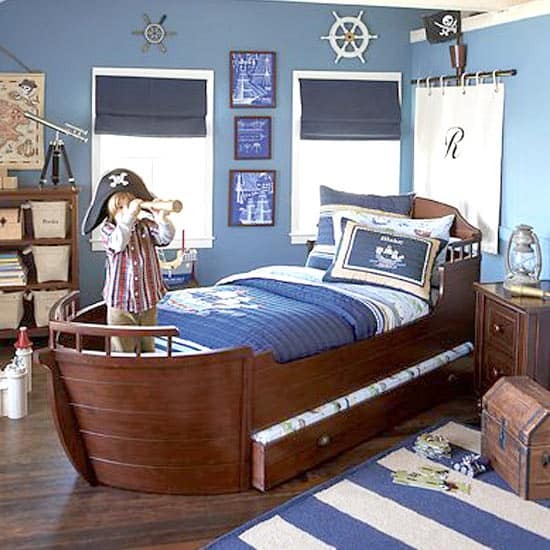 If you’re handy enough, you could even build a pirate ship based around the twin size bed frame. Sometimes a guy just needs a little man time, where he can survive the African plains and sleep among the wild lions. 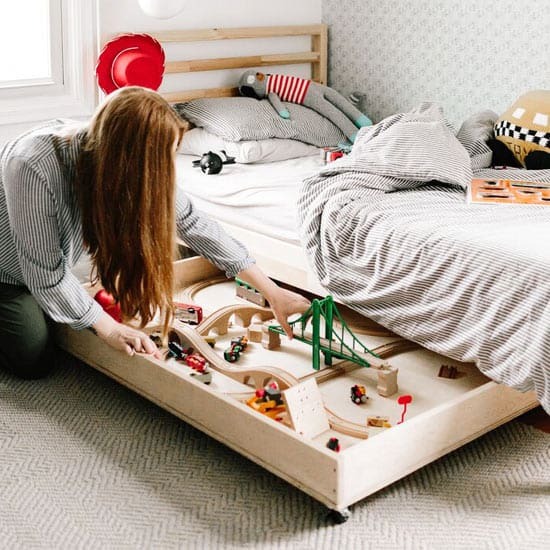 You’ll need to plan this out carefully and make sure every part of the structure is solid enough for your 3 year old to clamber on without getting hurt. But, in the end, it might just be 100% worth it! 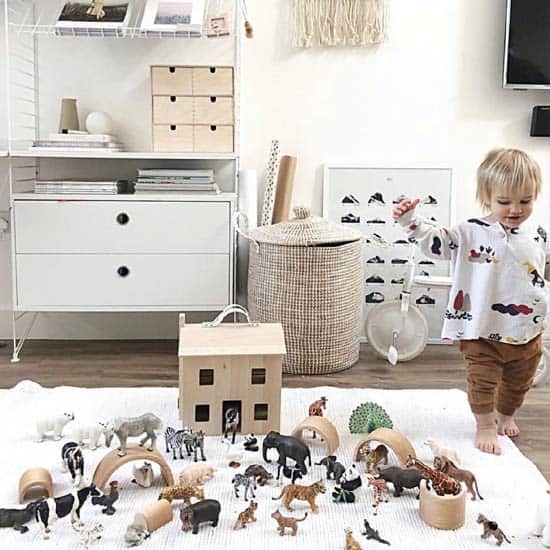 Build an entire collection of zoo animals to play with. I have it on good authority that 3 year olds love animals. 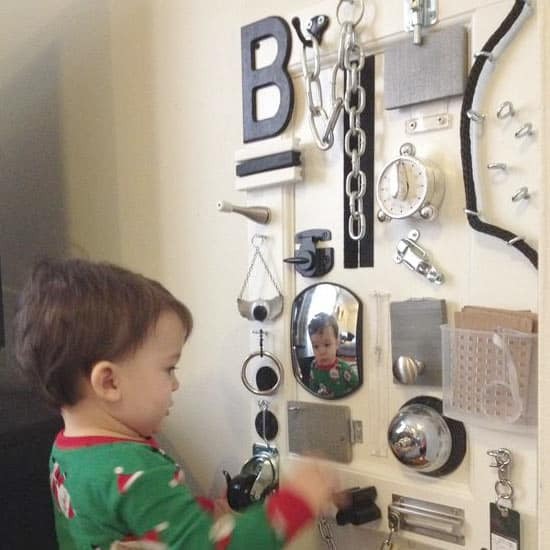 This should keep them entertained for hours and make their bedroom a place they absolutely love! Plush stars are more than just comfortable pillows… they make a little girl’s bedroom shine! Rose-gold and steel with hints of silvery pink accents transport your child’s bedroom into a magical dreamland. Don’t forget the white moon as the mobile centerpiece, hanging weightlessly above you as you drift into slumber.